"Then by StarClan, I give you all your warrior names." continued Splashstar. "Recklesspaw, you will be known as Recklesstail. Pebblepaw, you will be known as Pebbleblossom. Poolpaw, you will be known as Poololive. Shrewpaw, you will be known as Shrewtooth. Flamepaw, you will be known as Flamepetal. Ivypaw, you will be known as Ivyclaw. Rosepaw, you will be known as Rosefern. Snowpaw, you will be known as Snowsedge. Mosspaw, you will be known as Mosstrout. Heatherpaw, you will be known as Heatherwing. Reedpaw, you will be known as Reedheart. Hawkpaw, you will be known as Hawklight. Redpaw, you will be known as Redferret. 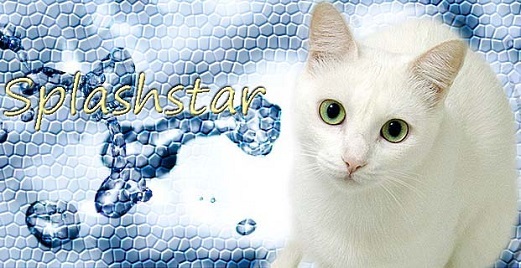 StarClan honors you all and we welcome you all as full warriors of RiverClan." Recklesstail purred happily as the clan called out their new names. Pebbleblossom puffed out his chest in pride as the clan called out their new names. Poololive puffed out his chest, listening to the clan call out their new names. Shrewtooth raised his head up proudly, listening to the clan call out their new names. Flampetal snorted quietly to herself, listening to the clan call out their new names. Ivyclaw puffed out his chest in pride as the clan called out their new names. Rosefern purred to himself as the clan called out their new names. Snowsedge raised his head up proudly, listening to the clan call out their new names. Mosstrout loudly purred as the clan called out their new names. Heatherwing purred happily, twitching the wet tip of her tail. Reedheart purred loudly as the clan called out their new names. Hawklight puffed out her chest in pride as the clan called out their new names. Redferret sat there, listening to the clan cheer for them. "Recklesstail, Pebbleblossom, Poololive, Shrewtooth, Flamepetal, Ivyclaw, Rosefern, Snowsedge, Mosstrout, Heatherwing, Reedheart, Hawklight, Redferret!" cheered Silverlight for the clan's new warriors. Wildlion padded past her clanmates and into the nursery, squeezing inside carefully. Once inside, she dipped her head to the other queen and settled down into an empty nest. Lilyfeather pulled a hare from the fresh-kill pile and carried it over to Pearlmist to share.